Award winning artist, Robin Frisella of Manchester, NH was selected to receive the designation of Master Pastelist from the Pastel Society of America after winning the Lila Gold Memorial Award for her pastel painting, “White Pumpkin”. This award was presented at the reception for the 42nd Annual Exhibition, Enduring Brilliance in New York City, NY on September 25, 2016. Robin Frisella is an international artist who is known for her realistic still life paintings in pastel. Robin’s “White Pumpkin” painting was chosen through the PSA’s annual member’s exhibition which draws over 1,400 entries from across the globe. Her piece was 1 of 180 paintings on display at the National Arts Club in NYC. In addition, her piece was selected as 1 of 20 paintings traveling to the Butler Institute of American Art in Youngstown, OH for exhibit in their Museum December 2016 – February 2017. Robin Frisella lives in Manchester, NH and creates her stunning still lifes at her Hampton Falls Gallery and studio, Frisella Fine Art. The paintings Robin creates have a photo-realistic quality but they are hardly images captured in a flash. She painstakingly arranges the objects she has chosen to paint – often pieces of nostalgia that are striking in their antiquity and grace. She blends pure pigment on sanded paper to artfully achieve the tones, lights and shadows of these objects she has so deliberately assembled. The results are still lifes in sheer splendor, memories and moods come to life through layer upon layer of pastel patiently stroked in natural light. In 2000, after taking a local pastel class, Robin found her calling. Art would be more than a pastime; it would be her life’s work. She left her job of 18 years and began teaching art herself. The first piece she entered in a juried competition won Best of Show. As her successes and followers grew, she decided to start her own gallery. Frisella Fine Art Studio opened in Candia, NH in 2006. Robin Frisella’s work has garnered numerous national and regional awards. She is a juried member of the Copley Society of Boston, signature member of the Pastel Society of NH and a Master Pastelist of the Pastel Society of America. Robin’s work has been published in the Best of America Pastel Artists Vol. II, The American Artist Magazine, New Hampshire Magazine, Artscope Magazine, Monadnock Table, The American Art Collector, The Artist Magazine and the Pastel Journal. Click on the calendar below for address/directions to the shows. Robin received 2nd place overall at the Art on the Common Show in Hampton Falls, June 2016. Photos from the event were included in Hampton Falls Living Magazine. Robin received 1st Place in Pastels for "Lemon Time" at the Mystic Outdoor Art Show, Mystic, CT, August 2016. 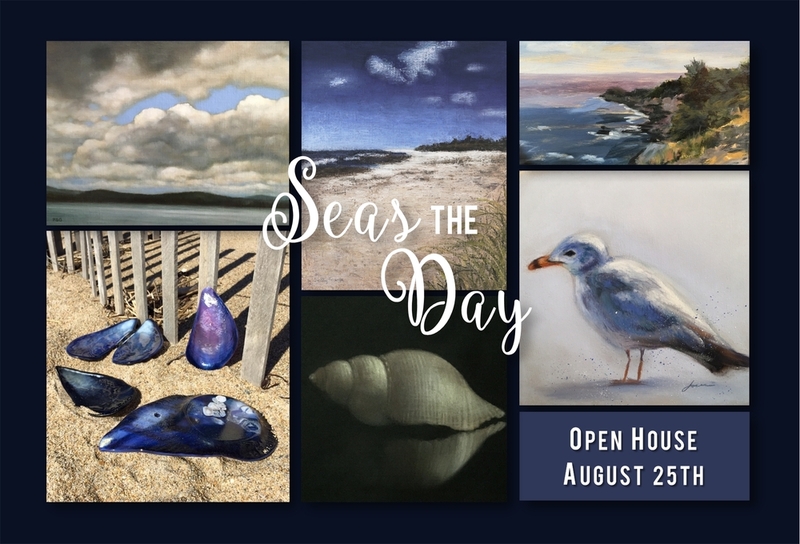 Featuring Original Artwork, Fused Glass & Unique Jewelry by Award-Winning Artists, Robin Frisella psa, Debby Frisella, Doreen Boissonneault, Patricia Gordon, Beth McGavock, Sharon Price, Josee Severino, Verne Orlosk, Andrea Guay, Amy Vander Els, & Peter Jeziorski. Join the Artists for Hors d'Oeuvres & a special performance by local violinists Madeline & Morgan Hoyt. 10% of all sales between 8/25 - 9/30/16 will be donated to the National Kidney Foundation. 10% of all sales from August 25 - September 30, 2016 will be donated to the National Kidney Foundation in loving memory of my Father, Raymond Hebert. I was so proud of my Dad. He took his first painting class at age 89 at Hanover Hill Healthcare Center with my Sister-in-Law, Carol. Little did he know that his painting would reflect our theme "Seas the Day". My Dad was always so excited to hear about my shows, especially the dollar amount of my awards. He would say, "Well, you made a good decision to quit your job". When he first saw the new Gallery space, he commented, "now this is a classy joint". He was the best. I miss him everyday, but I am grateful for all the wonderful memories. Love you Dad! With the snowy New Hampshire weather starting it's time to head to Florida for some warm weather Art Festivals. Join us for Cocktails& Hors d'oeuvres at our Artist Reception: Sunday, Feb. 14, 12 - 4 pm. Robin's painting Mother's Day has been selected for permanent installation at Mt. Ascutney Hospital. Watch for the July/August 2016 issue of The Artist's Magazine where Robin's painting, "Apples and Stripes" will be featured for her 1st place win in the pastel category of the All Media Competition! Shopper's Village - 87 Lafayette Road Suite 6, Hampton Falls, NH! The new Gallery is now open and features original artwork and jewelry by artists Robin Frisella psa, Doreen Boissonneault, Debby Frisella, Patricia Gordon, Andrea Guay, Beth McGavock, Sharon Price and Josee Severino. We also have a selection of gifts and home accents. Open Monday - Saturday 10am- 5pm. Stop by and say hello! Robin was selected to receive the Directors’ Award this year presented by the Pastel Society of New Hampshire. This award is given to a person, who in the directors’ opinion, has been exemplary in supporting the mission and goals of the society. Her generosity and assistance with the Outreach program were noted. Join Robin Frisella, PSA, as she hosts a workshop on how to create realistic still life paintings in pastel. Robin takes step-by-step approach to painting the still life, from the sketch to the finished piece. We begin the day with a short demonstration followed by plenty of class time and individual attention. Students will learn how to layer soft pastels on sanded paper to bring their painting to life. Frisella Fine Art is moving to the Seacoast!! In 2006 Robin opened Frisella Fine Art Studio in Candia, NH to be her full time working studio and host an ongoing exhibit of her artwork. In January 2016, Frisella Fine Art is thrilled to celebrate 10 years with a move to a larger space at Shoppers Village in Hampton Falls on the NH Seacoast. The Gallery will be a nice compliment to the established businesses already in Shoppers Village; Lighting by the Sea, Fiddlesticks, and Prim Fashions among others. Open House & Artist Reception on Saturday, November 28, from 2 – 7 PM & Sunday, November 29, from 2 - 5pm. Join us for wine and hor d'ouevres and to meet the artists Robin Frisella, Doreen Boissonneault, Gina Casale, Debby Frisella, Beth McGavock, & Josee Severino. This is the third exhibit in our successful partnership with Co|So to bring artists and their original artwork to the DH Gallery. Visual Feast is a collection of small works of original art from Copley Artists featuring still life’s of a subject important to anyone’s Home…food. It has a serious, colorful and whimsical side and we hope you will come take a look. Artists are Robin Frisella, Barney Levitt, Jeanne Rosier Smith, Matt Miller, Susanne Taylor and Claudia Kaufman. Please join us Tuesday, November 17 from 5 to 7:00pm for a cocktail and hors d’oeurves reception with the artists. Show runs through January 1, 2016. Pick up your copy of the November / December 2015 issue of Artscope to read Linda Chestney's review of Robin's SIMPLY REAL Solo Exhibition at the Copley Society of Art. Pick up the November / December Issue of Monadnock Table Magazine to see several images of Robin's work, including "Holiday Warmth" on the cover.